Gottfried Leibniz employed integral calculus for the first time to find the area under the graph of a function y=f(x). J. C. Watson discovered asteroid #179 Klytaemnestra. A. Kopff discovered asteroid #621 Werdand. George Van Biesbroeck discovered asteroids #1027 Aesculapia and #1464 Armisticia. A patent was awarded to Albert Einstein and Leo Szilard for their invention, the Einstein Refrigerator, which has no moving parts and uses heat as its energy source. The Einstein Refrigerator is a unique type of refrigerator co-invented in 1926 by Albert Einstein and former student Leo Szilard. It is a single pressure absorption refrigerator. A prototype has shown the viability of the Einstein refrigeration cycle. On 11 November 1930, patent number US1781541 was awarded to Albert Einstein and Leo Szilard. The patent covered a thermodynamic refrigeration cycle providing cooling with no moving parts, at a constant pressure, with only heat as an input. The refrigeration cycle uses ammonia (pressure equalizing fluid), butane (refrigerant), and water (absorbing fluid). The Explorer 2 balloon set an altitude record of 72,395 feet (22.066 km) over South Dakota. Goethe Link Observatory discovered asteroid #3185. Purple Mountain Observatory discovered asteroid #3543. NASA launched Gemini 12 Target (Agena Target Vehicle 12, GATV-5001), an Agena booster used as a rendevous and docking target for Gemini 12. NASA launched Gemini 12 with astronauts Jim Lovell and Buzz Aldrin aboard for a 4 day flight. L. Chernykh discovered asteroid #2385 Mustel. J. Gibson and C. U. Cesco discovered asteroid #1920 Sarmiento. S. Barros discovered asteroid #2757 Crisser. Purple Mountain Observatory discovered asteroid #3139; Z. Vavrova discovered asteroid #2581 and #2706. NASA launched STS 5 (Columbia 5, Shuttle 5), the first flight of the shuttle with a commercial payload, which deployed Canada's ANIK C-3 and Satellite Business Systems' SBS-C commercial communications satellites. The STS 5 launch on 11 November 1982 proceeded as scheduled with no delays. 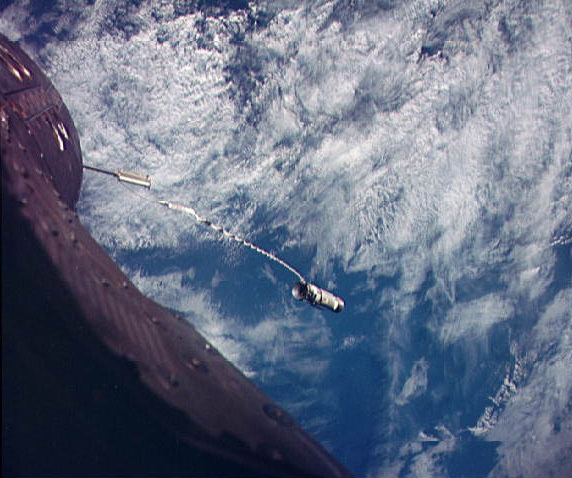 STS 5, the first operational Shuttle mission, deployed two commercial communications satellites, ANIK C-3 for TELESAT Canada, and SBS-C for Satellite Business Systems. Each was equipped with a Payload Assist Module-D (PAM-D) solid rocket motor, which fired about 45 minutes after deployment, placing each satellite into a highly elliptical orbit. One Get Away Special and three Shuttle Student Involvement Program (SSIP) experiments were conducted. 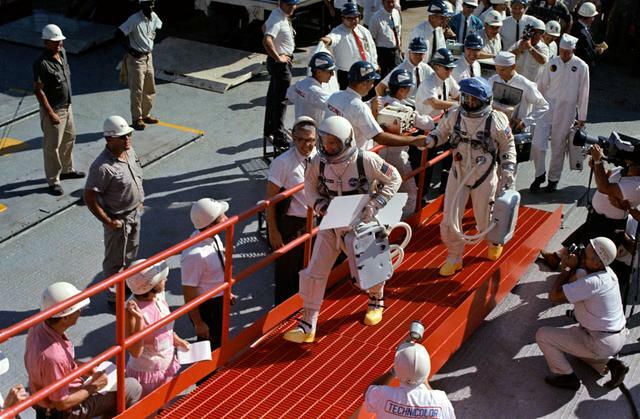 The first scheduled space walk in the Shuttle program was cancelled due to a space suit malfunction. STS 5 ended 16 November 1982 when Columbia landed on revolution 82 on Runway 22, Edwards Air Force Base, California, with a rollout distance of 9,553 feet, and a rollout time of 63 seconds. Orbit altitude: 184 nautical miles. Orbit inclination: 28.5 degrees. The mission's duration was five days, two hours, 14 minutes, 26 seconds, traveling 2.1 million miles. Columbia was returned to the Kennedy Space Center 22 November 1982. The flight crew for STS 5 was: Vance D. Brand, Commander; Robert F. Overmyer, Pilot; Joseph P. Allen, Mission Specialist; William B. Lenoir, Mission Specialist. Russia launched Progress M-25 to the Mir space station, carrying more than 2 tons of supplies and a Raduga capsule that was used to return about 150 kg of experimental results to the ground.